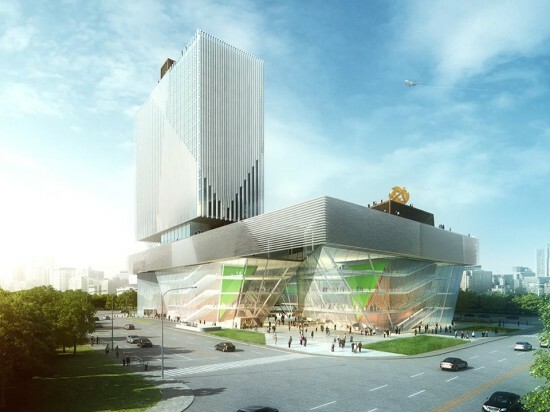 Construction has recently been completed on UNStudio's Hanjie Wanda Square, a new luxury shopping center in Wuhan, China. The firm boldly coated the exterior of the building in over 42,333 metallic spheres, bestowing a fluidity to the facade that extends into the interior of the structure. There, curved walkways and corridors flow together in order to carry shoppers throughout the upscale retail stores, catering outlets, and movie theaters within the center. North and South atria anchor the inside of the building, the former bedecked in gold and bronze tones, while silver and reflective materials pervade the latter. These elements are purported to speak to a "cultural traditional identity" and "city identity and urban rhythm" respectively. 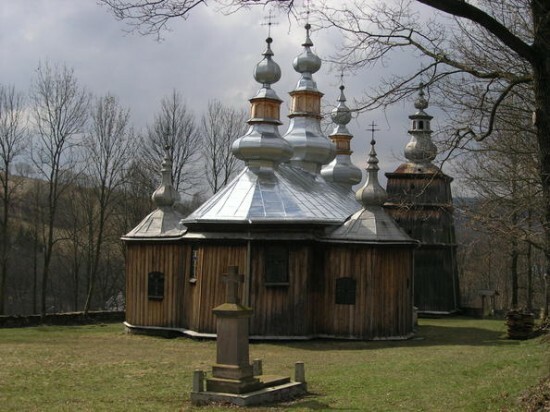 Each opening is capped by a large skylight. Each steel ball-bearing houses an LED light that projects multiple colors onto a laminated glass surface that cloaks the building. 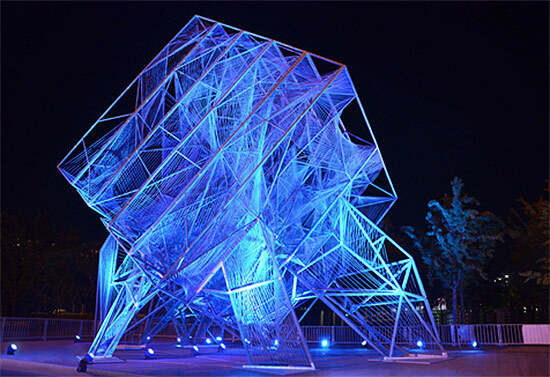 The facade thus acts as a canvas for the numerous effects generated by the combination of colored light and pattern. 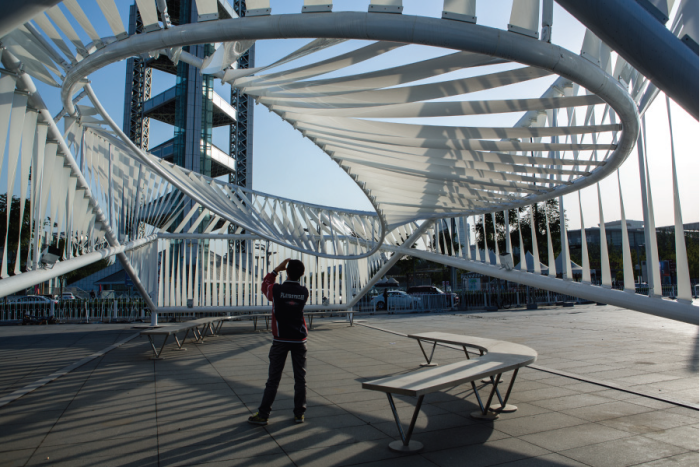 Such dynamism echoes the the approach adopted by UNStudio in other projects the firm has undertaken in Korea, Taiwan, and Bejing. Wanda Square will soon be joined by other UNStudio projects cropping up throughout China. While the firm initially established a Shanghai location in order to aid in the development of its Raffles City Development in Hangzhou, the once temporary branch has been transformed into a fully operational extension of the Amsterdam-based office. 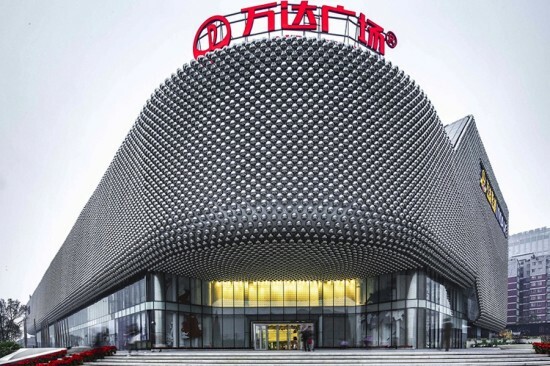 The completion of the mall comes in the wake of recent competition wins for the pavilion for the 2014 Horticultural World Expo in Qingdao and a large-scale multi-use development in Bejing within the coming years. Next Tuesday, the nearly 850-foot-tall Shenzhen Stock Exchange Building will be inaugurated as the new head of capitalist trading in Hong Kong. 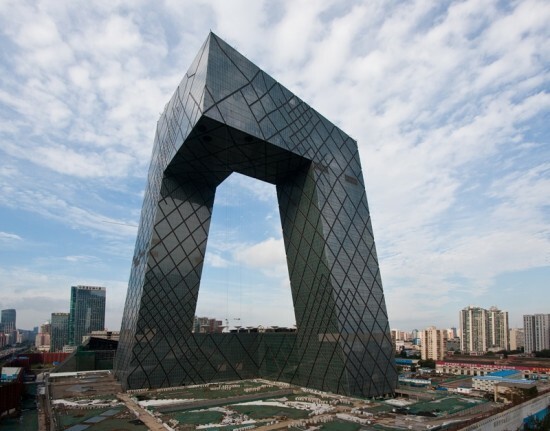 OMA, Rem Koolhaas’ architectural firm, was commissioned to design and construct the soaring structure in 2006. After nearly $500 million in expenditures, according to reports by the Wall Street Journal blog, the square-form skyscraper with a surprising floating base, is complete. 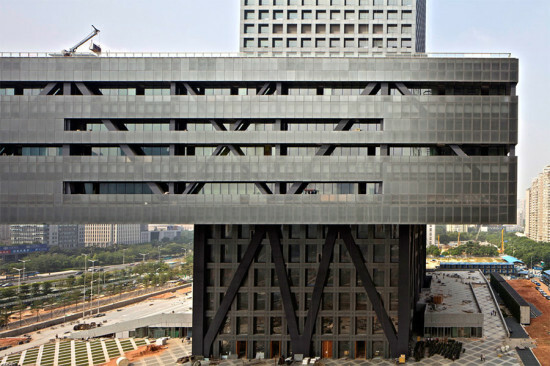 Situated 118 feet above an outdoor, ground-level plaza, the Shenzhen Stock Exchange’s three-story cantilevered podium creates drama in the building’s form while satisfying practical needs. This floating base provides shade to pedestrians, a garden rooftop, and an outward indication of interior operations. OMA located the stock exchange’s main trading floors in the interior of this base, allowing maximum square footage for the computer servers. With a facade constructed of a gridded exoskeleton over a patterned glass curtain wall, the building reacts to changes in weather, muting to reflect grey days and brightening when the sun peeks out. The generic skyscraper design of the rest of the structure allows it to fit in with existing neighbors, but clever details like these set it apart from the typical. Coop Himmelb(l)au recently won a competition to design the Deep Pit Ice and Snow World in the Dawang Mountain Resort area near the city of Changsha. The quarry project, which also featured proposals from Gensler and Asymptote, is the second of its kind in China, following the Songjiang Shimao Hotel outside of Shanghai. 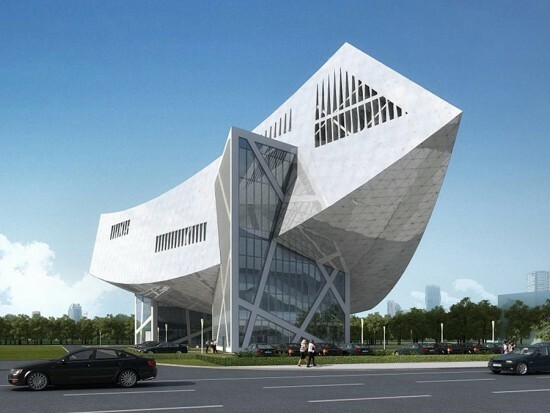 It is one of many new schemes for Changsha from international architects such as Zaha Hadid. The 394,000 square foot project is positioned directly on top of a historic cement mining quarry pit and lake, and consists of an Entertainment Ice World, Indoor Ski Slope, Water Park and restaurant and shopping facilities. 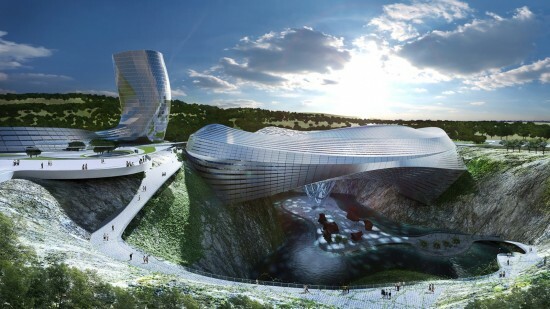 The design emphasizes the existing quarry pit and the 560 foot spanning sculpted shell of the Snow and Ice World. The Shell, which spans from cliff to cliff, covers a sunken and hanging garden, creating a new leisure space of islands, water pools, cliffside pathways and ramps that connect the building to its natural surroundings. Other highlights include a cantilevered outdoor swimming pool that also creates a 200-foot-tall waterfall into the quarry pit. A central glass cone provides controlled natural daylight to the Ice World structure and the islands and water surfaces below, and a sculptural 330-foot-tall tower will is to the Ice World via a grand central plaza. The project is slated to start construction sometime in 2014 with an expected completion date in 2016. While it's been well-documented that China has been "borrowing from" U.S. designs for some time, it appears that relationship is starting to go both ways. Downtown Los Angeles is ready to get a new residential project that bears a striking resemblance to Steven Holl's Linked Hybrid apartment complex in Beijing. Note the porous, gridded facade and the glassy skybridges, to name just a couple of similarities. The mixed-use Medallion 2.0, designed by Kevin Tsai Architecture, would be located off the corner of Third and Main Streets, reported downtown blogger Brigham Yen. It's scheduled to break ground in 2015 and include 400 rental units, a theater, retail, and over half an acre of green space. We'll keep you posted on more Asian imports as they no doubt continue to arrive. In 2005, the doors to the New South China Mall first opened, promising a new age of Chinese consumerism and signaling the rise of the middle class. Located outside Dongguan, an industrial city located in the rapidly-growing Pearl River Delta with a population comparable to New York’s, the nearly 10 million-square-foot mall was the largest in the world in terms of leasable space. The developer, Chinese instant noodle tycoon Alex Hu, expected 100,000 daily shoppers, but the crash-strapped factory workers who populate the nearby metropolis never bothered to make the 2.5-hour trek to the overgrown shopping center, and so 8 years later 99 percent of the mall’s 2,350 retail outlets are still vacant. In the wake of this failure, a new developer, the Dongguan Minying Real Estate Development Company, has hired California-based architecture firms 5+Design and SWA to design yet another mega-sized mall in the rapidly growing city, this time with a few important adjustments that the team hopes will make their project a success. 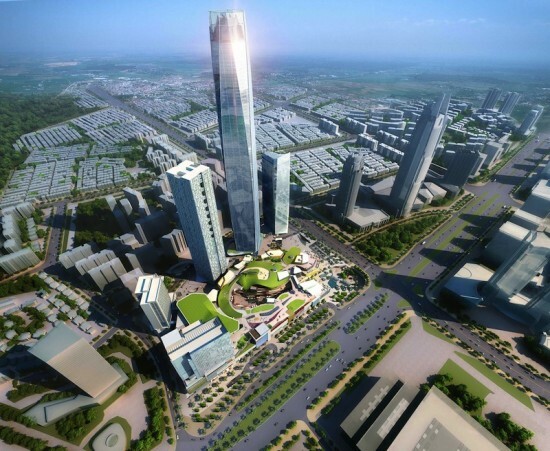 Developers of the 11 million-square-foot Dongguan International Trade Center (DITC) hope to succeed where the New South China Mall failed by offering an accessible downtown location with integrated public transit, lush landscaping, and a diverse, mixed-use program. Situated at the intersection of several public transit lines in the center of the city, the 1 million-square-foot site will be connected to multiple subway and bus routes, as well as provide pedestrian and bicycle access to offer an enticing alternative to the traditional car-based mall. The development will be composed of five towers gathered around a compact, 6-story retail complex. The towers, while all rendered in reflective glass and metal paneling, each have their own distinct design and program. The tallest of the five, coming in at 1,409 feet, will be the 25th tallest building in the world and contain offices and a club, while the others will house offices, a hotel, creative technology studios, residential spaces, and a bank. At the center of the DITC will be the retail center, containing a wide spectrum of tenants to cater to the city’s economically diverse population, as well as a below-ground market hall, exhibition spaces, an ice rink, amphitheater, rooftop park, health club, and a 15-screen cinema. But, still, many may ask, why build a 11 million-square-foot mall in a city with an empty 10 million square foot mall? According to 5+Design principal Michael Ellis, a lot has changed in the years since the New South China Mall opened, and Dongguan is ready for something new. “There is a new generation in China that likes the conveniences of great shops and dining experiences near where they live,” Ellis told China Daily USA. “You see that in the US too, with young people moving to downtown Los Angeles for the same reason. It’s a worldwide trend, but new development is happening so quickly and at a large-enough scale in China that it allows us to operate freely there.” Construction of the DITC is set to be completed by 2015. It has just been announced that the Shenzen Biennale will be jointly curated by former NAi head Ole Bouman who will serve as Creative Director and American Jeffrey Johnson and Chinese scholar Li Xiangning, who will act as Academic Directors. 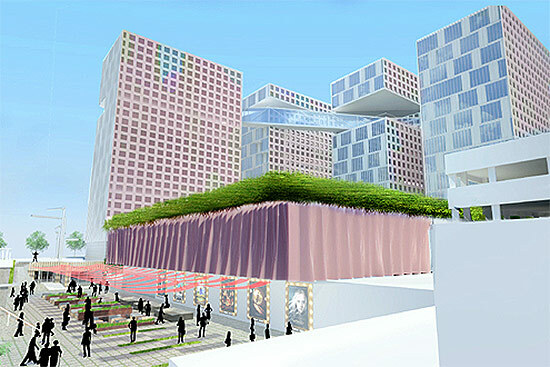 The theme of the biennale which opens in December 2013 will be urbanization "outside the mainstream" and will take place in multiple sites around the region. 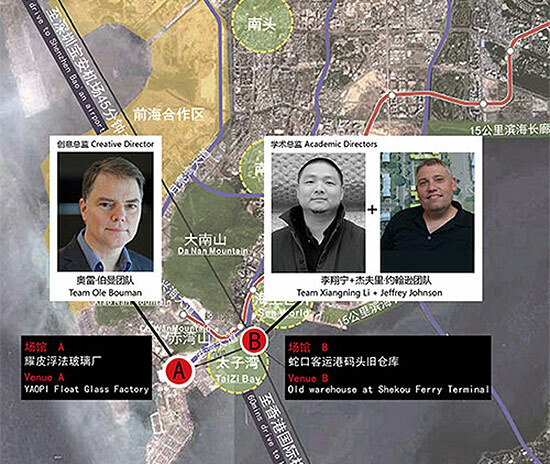 Bouman will be responsible for curating the exhibition, "focusing on forward-looking design practices, and large-scale works" while Li Xiangning and New York-based Jeffrey Johnson will be responsible for a curatorial review and theoretical research. The last Shenzen Biennale (2011) was curated by Terence Riley and was one of the most interesting architecture exhibitions of the year.